According to the National Institute of Health association between people and cannabis goes back as far as 3000 years. This is the primary reason, patients are opting for San Diego 420 evaluations. Especially after various studies have been published about the health benefits in renowned medical journals such as Neurology, Rheumatology, American Journal of Clinical Oncology concerning whether to use medical cannabis as a medicinal alternative or not. With the growing popularity of medical cannabis, as many as 33 states in the United States have legalized the therapeutic use via medical marijuana card that is recommended by the physicians. Through the legalization of cannabis in the initial stages, a gateway has been opened for the pharmaceutical research which has led to the discovery of the endocannabinoid system. In this, we will understand where cannabis actually acts when being ingested or inhaled in the body. It is shown to be involved in most physiological systems affecting a long list of processes, from anxiety, depression, cancer development, vasodilatation to bone formation and many more. 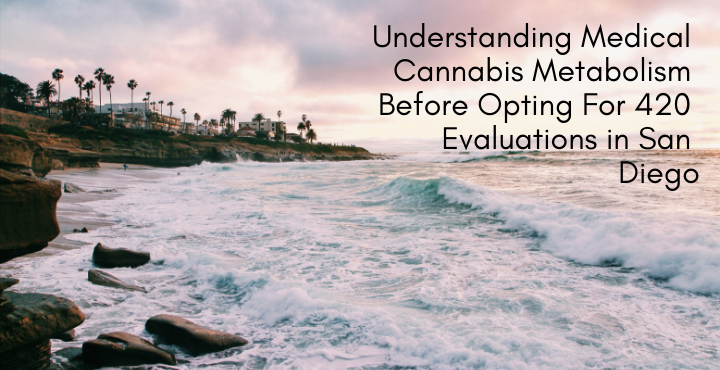 But still, the major question that arises is how our body will react and is it safe or not to use medical cannabis for therapeutic purposes before opting for San Diego 420 evaluations. So before analyzing what exactly cannabis does in our body, we should know about the system where cannabis acts to provide the desired result in patients recommended for its use. Our body is naturally producing endocannabinoids which are released in response to needs within the larger physiological system and are essential for the human body’s regulatory functions. These endocannabinoids interact with the receptors that are present in neurotransmitters produced for the EC system. The receptor sites are CB1 and CB2 which respond differently to different cannabinoids. CB1 is most prevalent in the CNS system where it is known to modulate stress, anxiety, increase appetite, decrease nausea and CB2 receptor is found mostly on cells of the immune system. Thus taking everything into account, the EC system helps to decrease pain, fight cancer, prevent neurodegenerative diseases thereby promoting overall health. How Does Cannabis Alters The EC System To Enhance Its Medicinal Ability? There are over 400 chemicals in marijuana, but only 61 of them are unique to the Cannabis plant and these are called cannabinoids like THC, CBD, CBN which mimic the behavior of the endocannabinoids that are produced naturally in our body, thus stimulating various therapeutic responses in the body. THC (Tetrahydrocannabinol), the psychoactive compound acts as an agonist for both CB1 and CB2 receptors but it tends to favor the CB1 receptor, thus causing the euphoria or high feeling. CBD (Cannabidiol) has low affinity for both the receptors hence, it acts as an indirect antagonist to the naturally occurring endocannabinoid from binding the receptor thus having an interesting role of overall affecting the levels of endocannabinoid in brain synapses, therefore, is also called endocannabinoid tone which ultimately does a lot more than just providing a state of heightened happiness. (Anandamide- the naturally occurring endocannabinoid is synthesized in areas of the brain that are important in memory, motivation, higher thought processes, and movement control, hence plays important role in pain, depression, and appetite). Through various research, it has been found that cannabis contains over one hundred cannabinoids including THC. These compounds work together to get better medicinal effects. Plus, these have the advantage of no drug addictions as CBD reduces drug cravings and also reduces dependency on commonly prescribed drugs which are potentially addictive and toxic. Vaporization is seen to be the optimal delivery method for cannabis. Unlike smoking, vaporization is achieved by heating cannabis to a temperature that vaporizes but does not burn the cannabinoids, thus eliminating the health risks that are being associated with smoking. The effects of inhaled cannabis are felt within minutes. Therefore you need to pause between inhalations to let the dose be fully realized. Now considering CBD and THC have many overlapping therapeutic qualities, including pain relief, anxiety, seizures, and nausea, although they work via different mechanisms of action. So patients getting treatment for chronic illness using drugs should consider this alternative method to restore their normal lives either through San Diego 420 evaluations from the licensed physician.